Between the bloody hand first look and a slightly menacing photo featuring Johnny Depp intimidating Michelle Pfeiffer, the adaptation of Dark Shadows from Tim Burton looks to be a fairly dark venture. However, it's been said that there's a strange kind of humor to the film, and that tone is somewhat prevalent in a new photo of Depp as the vampire Barnabas Collins, and while he still doesn't look all that friendly, it's not exactly terrifying either. Frankly, I don't think anyone knows what to expect from this film, but with such a spectacular cast including Chloe Moretz and of course Helena Bonham Carter, I hope it works out. Based on the 1960's gothic daytime serial with vampires, ghosts, ghouls, zombies, werewolves, parallel universes and time-paradoxes, Tim Burton is directing this adaptation of Dark Shadows written by author turned screenwriter Seth Grahame-Smith (Abraham Lincoln: Vampire Hunter). 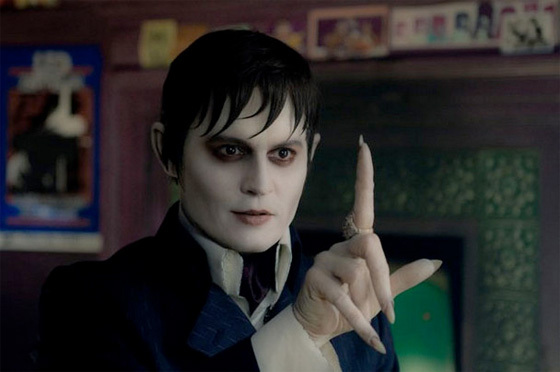 The film marks yet another collaboration between Burton and actor Johnny Depp, playing vampire Barnabas Collins, and the filmmaker's wife Helena Bonham Carter. The rest of the cast includes Chloe Moretz (Let Me In), Jackie Earle Haley (Watchmen), Eva Green (Casino Royale), Michelle Pfeiffer (Stardust) and more. Warner Bros. is bringing Dark Shadows to theaters everywhere on May 11th, 2012. Looking good? That definitely looks more like him, if that's what they were trying to achieve..
No one is supposed to know Barnabas is a vampire, at least at first. A three-year old could spot this guy a mile off. Where is the trailer ??? Does anyone know ?? are you serious Johnny Depp...get away from these make up wearing, emo looking roles and make a serious movie again! like Public Enemies. In watching the trailer just now, and being a loyal "Dark Shadows" follower years ago; they have made a complete mockery of a simple spooky romance. I am afraid any real "Dark Shadows" fan will be thoroughly disgusted! They shouldn't even be allowed to name it that. It should be considered 'based on' Dark Shadows or 'Inspired by'. It just shows the direction in which this society is moving. It wasn't ever meant to be a comedy! The movie "idiocracy" seems to have coined where we are headed! People, get over yourselves. It it's just a movie. Yes, I am a big Tim Burton fan he's the most creative person in the world, and Johnny is one of the most handsome and lovable actors who know how to have fun and not take everything so seriously.